﻿ Success of MEIBAT in MATELEC Industry 2016! 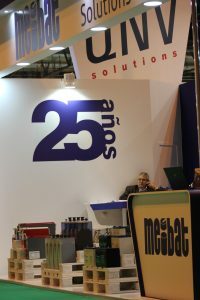 MATELEC Industry 2016 It has been the ideal scenario for the new brand image MEIBAT, the couple to celebrate their 25 years. 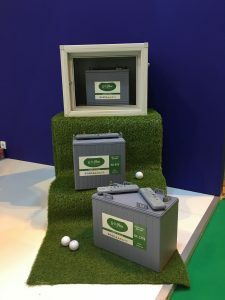 For the first time in its history, the company has been involved in one of the most important European trade fairs, where, over four days, has shared with the audience their knowledge and experience in industrial batteries. 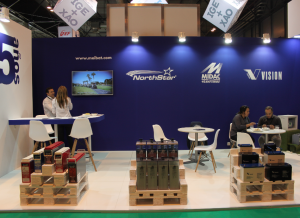 In the stand, Industry MATELEC attendees were able to learn from the hand of our expert team different brands that we distribute exclusively for Spain and Portugal: Midac, European high quality for all applications, NorthStar, American high quality for the most demanding applications, VISION, AGM batteries leading manufacturer with the highest standards of quality and GolfBat, the deep cycle batteries ideal for any golf cart. 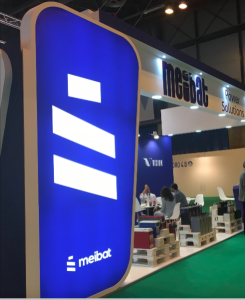 In addition to presenting its different brands, MEIBAT has used the event to launch its new corporate image, which it has been fully integrated into our Stand, becoming one of its pillars and hinting to everyone who visited us, what it was to come. This new image, It will be responsible for continuing to represent perfectly the spirit of MEIBAT and values ​​that so many years have been putting the heart of the brand. Both the new image, as the stand design, as the products presented throughout the Fair, They have surprised and have been very well received among all visitors to it. We close this edition of MATELEC Industry with a "good taste", which it would not have been possible without the team of professionals that make MEIBAT. It only remains to thank all those who sacasteis a niche for stopping by our booth, the time spent and say it has been a pleasure to share with you.